After a record-setting 122.4 million votes, it was country crooner Scotty McCreery who was named the winner of ‘American Idol’ season 10. Though McCreery was a heavy favorite leading into Wednesday night’s results, the judges gave the slight edge to Alaina on Tuesday, especially after her emotional final performance of her original single, ‘Like My Mother Does.’ In the end, though, America couldn’t resist McCreery’s deep vocals and indelible country charm. Beyond the results, the ‘Idol’ finale featured a number of epic moments, from star-studded performances to the return of the Top 13. Among the A-listers who took the stage tonight were Beyonce (who performed her new song, ‘1+1′), Lady Gaga, Judas Priest (who performed with fourth-place finisher James Durbin), Jack Black (who performed with Casey Abrams) and, of all groups, TLC. 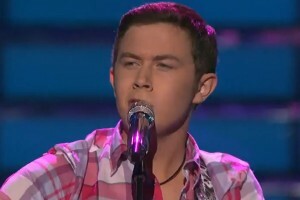 And keeping in form with season 10’s all-country finale, McCreery got to perform with Tim McGraw, while Alaina sang a duet with her own American Idol, season 4 winner Carrie Underwood. Check out McCreery’s performance of his new single, ‘I Love You This Big,’ below, then sound off: Did he deserve to win ‘American Idol’ season 10? Or should the title have gone to somebody else? Sign up to have exclusive VIP Club contests, events, coupons, presales and much more delivered to you for FREE! It appears that you already have an account on this site associated with . To connect your existing account just click on the account activation button below. You will maintain your existing VIP profile. After you do this, you will be able to always log in to http://classicrock1069.com using your original account information. Sign up to have exclusive All Access Pass contests, events, coupons, presales, and much more delivered to you for FREE.